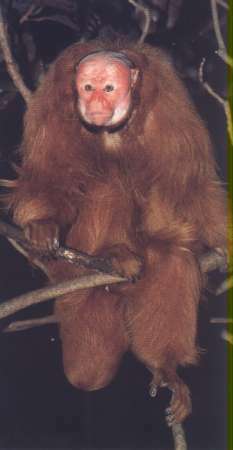 The Red Uakari is listed (2003) as an endangered species. It is found in Brazil, Peru and has been reported but not confirmed in southern Columbia. They are listed as vulnerable due to habitat loss and they are hunted for food. They weigh around 2 to 3 kgs (4.4 to 6.6 pounds) and are about 35 to 60 cms in length. The tail is around 15 cms in length. Their body is covered in red hair (hence the name Red Uakari). The colour of their fur however, may range between almost white to a very dark red-brown. They have a distinct strange bright red hairless face. Little is known why their face is of such a colour, but it has been suggested that it may be for the same reason birds may be so colourful. To make it easier to spot members of the troop in the thick and dense forest. Their faces have also been reported to fade if they are kept indoors in captivity, so exposure to the sun may also be a big factor. They feed insects, seeds, nuts, fruits, nectar and other such food sources. They live in groups of between 10 and 40. Reports of groups of more than 100 Uakari’s living together have been heard. They are agile creatures, and their tail is prehensile allowing them to hang from branches by the tail. They can jump bipedally, and can also run quadrupedally. They have been reported to jump 20 metres or more between trees. The female gives birth to a single young, and the new born Red Uakari is weaned for about 3 to 5 months. After this time, the young begins to feed on soft fruits and pods. E-mail to add your Red Uakari related website.